The Hieromartyr Antipas, a disciple of the holy Apostle John the Theologian (Sept. 26), was bishop of the Church of Pergamum during the reign of the emperor Nero (54-68). During these times, everyone who would not offer sacrifice to the idols lived under threat of either exile or execution by order of the emperor. On the island of Patmos (in the Aegean Sea) the holy Apostle John the Theologian was imprisoned, he to whom the Lord revealed the future judgment of the world and of Holy Church. "And to the angel of the Church of Pergamum write: the words of him who has the sharp two-edged sword. I know where you live, where the throne of Satan is, and you cleave unto My Name, and have not renounced My faith, even in those days when Antipas was My faithful martyr, who was slain among you, where Satan dwells" (Rev 2:12-13). By his personal example, firm faith and constant preaching about Christ, Antipas began to turn the people of Pergamum from offering sacrifice to idols. The pagan priests reproached the bishop for leading the people away from their ancestral gods, and they demanded that he stop preaching about Christ and offer sacrifice to the idols instead. Antipas calmly answered that he was not about to serve the demons that fled from him, a mere mortal. He said he worshiped the Lord Almighty, and he would continue to worship the Creator of all, with His Only-Begotten Son, and the Holy Spirit. The pagan priests retorted that their gods existed from of old, whereas Christ was not from of old but was crucified under Pontius Pilate as a criminal. The saint replied that the pagan gods were the work of human hands and that everything said about them was filled with iniquities and vices. He steadfastly confessed his faith in the Son of God, incarnate of the Most Holy Virgin. 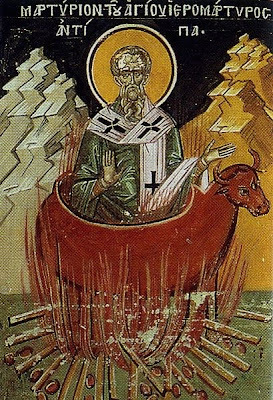 The enraged pagan priests dragged the Hieromartyr Antipas to the temple of Artemis and threw him into a red-hot copper bull, where usually they put the sacrifices to the idols. In the red-hot furnace the martyr prayed loudly to God, imploring Him to receive his soul and to strengthen the faith of the Christians . [He also asked forgiveness for his tormentors and that he would help be a source of healing to the faithful, especially those suffering from ailments of teeth]. He went to the Lord peacefully, as if he were going to sleep (+ c. 68 or c. 92). At night Christians took the body of the Hieromartyr Antipas, which was untouched by the fire. They buried him at Pergamum. The tomb of the Hieromartyr became a font of miracles and of healings from various sicknesses. 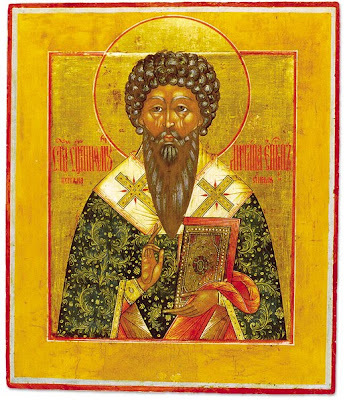 We pray to the Hieromartyr Antipas for relief from toothache, and diseases of the teeth. Antipas is mentioned in the Book of Revelation as, "Antipas, my faithful witness, who was martyred among you, where Satan lives" (Rev. 2:13), i.e., in the city of Pergamum. The inhabitants of this city lived in the darkness of idolatry and in extreme impurity. They were slaves to passions. They were slanderers, tyrants and they were incestuous. In other words, they were the servants of Satan. Here among them lived Antipas, "As a light in the midst of darkness, as a rose among thorns and as gold in mud." He who captured and killed a Christian, would be deemed as good and just. The totality of pagan belief consisted of soothsaying, interpretation of dreams, serving demons and extreme perversion. Being frightened of Antipas as from fire, the demons appeared to the soothsayers in a dream and confessed how afraid they were of Antipas and how, because of him, they must depart from this city. The pagan priests summoned a large number of people against Antipas and began to interrogate and to force him to deny Christ and to worship idols. Antipas said to them: "When your so-called gods, lords of the universe, are frightened of me, a mortal man, and must flee from this city, do you not recognize that, by this, your faith is an aberration?" The Saint also spoke to them further about the Faith of Christ as being the only One, True Saving Faith. They became enraged as wild beasts and dragged the aged Antipas to the temple of Artemis before which stood an ox cast in bronze. They heated the bronzed ox and hurled the servant of God into the red-hot molten ox. From within the molten ox, St. Antipas glorified God with thanksgiving, as once did Jonah in the belly of the whale or the Three Youths in the fiery furnace. Antipas prayed for his flock and for the entire world until his soul parted from his weakened body and ascended among the angels into the Kingdom of Christ. He died suffering and was crowned with unfading glory in the year 92 A.D.
For these sufferings, a hundred-fold thanks be to You! That I be more precious according to heavenly worth. In this town, in awful dung! And their hearts to You be fixed. Direct them to You, the only One to serve. And finally, to You I pray: may it be better for the Church! In 610 A.D. the future Roman Emperor Heraclius had the beheaded body of Emperor Phocas burned in a brazen ox. This brazen ox was the same one used to slowly burn alive Saint Antipas the Martyr, whom the Lord speaks of in Revelation 2:13. 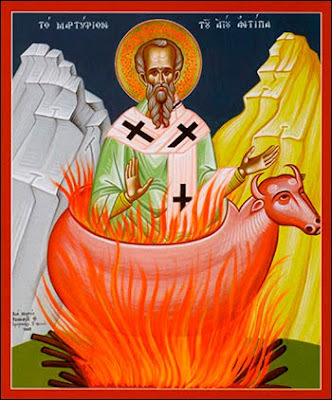 Saint Antipas was sentenced to be burned alive in the brazen ox at the age of 83. This ox had been donated by King Attalus of Pergamum (241-197 BC) on the Acropolis of the city of Pergamum as a trophy of victory against the Gauls. It was transferred by the Romans to the Egyptian temple of Serapis in Pergamon, who honored the ox as a sacred animal. The body of St. Antipas also was buried outside the city where later a small church was built in his honor. Emperor Theodosius brought the ox and relics to Constantinople. Today the relics of St. Antipas can be found in many places. A portion of his skull is in Patmos, Dionysiou Monastery at Mount Athos has his right arm, and his jaw is at Great Lavra Monastery on Mount Athos. More relics can be found in places such as the Phanar in Constantinople and the Metropolis Cathedral of Mytileni. 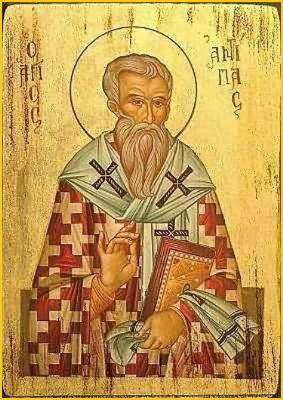 It should be noted that the relics of St. Antipas are myrrh-flowing. 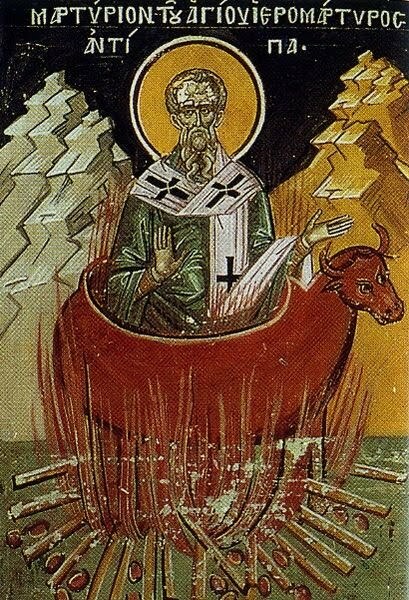 The celebrated hierarch and Pergamum's first prelate, the fellow-contestant of Martyrs and most divine myrrh-streamer, ye faithful, come let us honour now wise Antipas, who truly is a great and swift healer of severely afflicted teeth, and cry to him with our whole soul: Glory to Christ that hath glorified thee. Glory to Him that hath crowned thee. Glory to Him that worketh healings for all through thee. Unto the hierarch and renowned Great Martyr of the Lord, to the most excellent protector of all Pergamum, unto him that cast our common foe down in ruin, unto Antipas let us sing praises as is due, for he healeth them that suffer from afflicted teeth. Let us cry with love: Rejoice, O thrice-blessed Father.